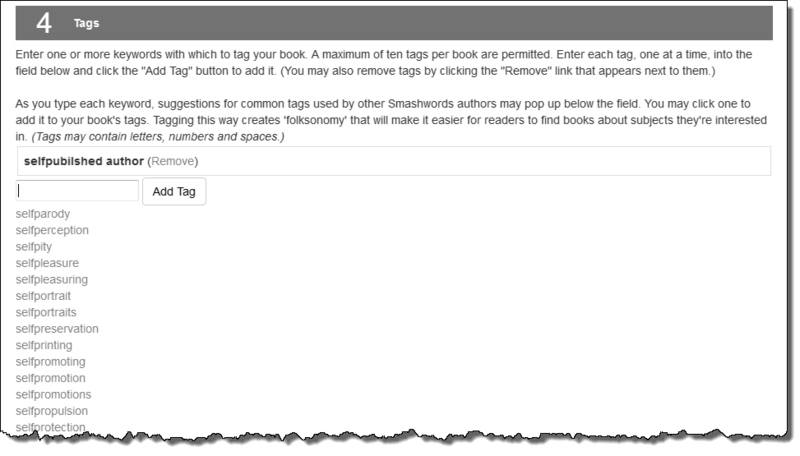 Keywords (choose up to ten); Smashwords combine 2-word keywords, e.g. self-publishing becomes selfpublishing. 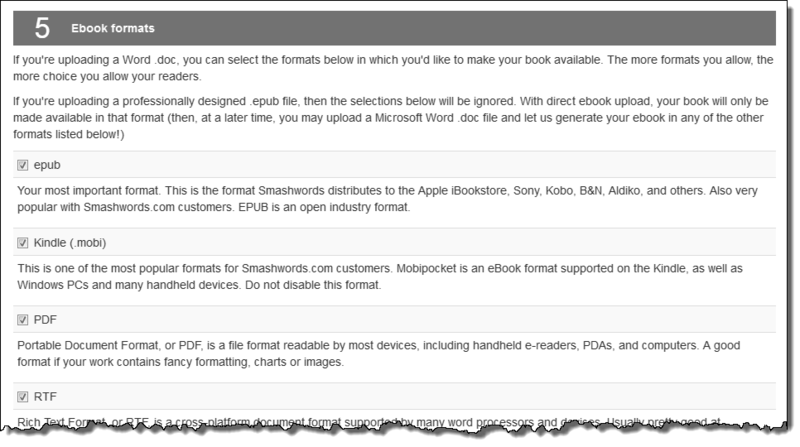 There are 8 steps to upload your ebook files to Smashwords. Create your free Smashwords account here: https://www.smashwords.com/signup, or if you already have an account, log in to your account. 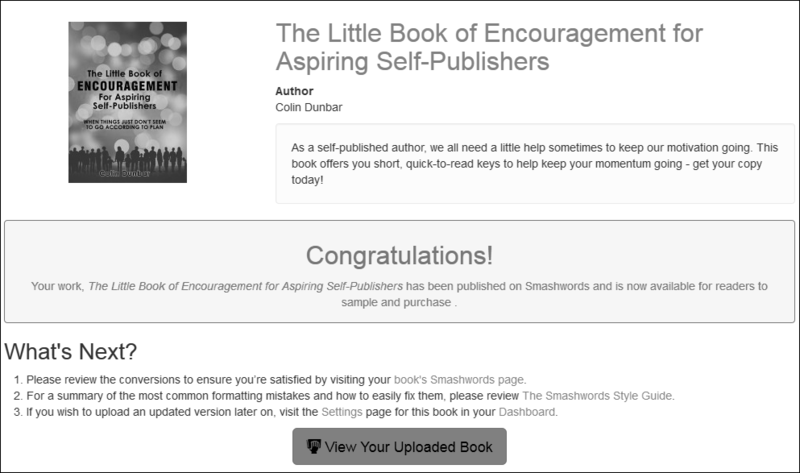 After you sign in, the Smashwords home page will display. Click the Dashboard link to open the dashboard. On the Dashboard page, click the Publish link. This is where you are going add the details of your book, and upload your book files. Type (or copy) your title in the Title field. If your book is ready to be published now, click the first radio button (For immediate release). The next section (Synopsis) is your book descriptions. Type or paste your Long description and Short description in the relevant text boxes. If your book is in a language other than English choose the language from the drop-down menu. If your book is written in English, you also have the option of choosing a specific dialect. Next you choose the price of your book. If you choose a fixed price, click the radio button adjacent to Charge a specific amount for my book. 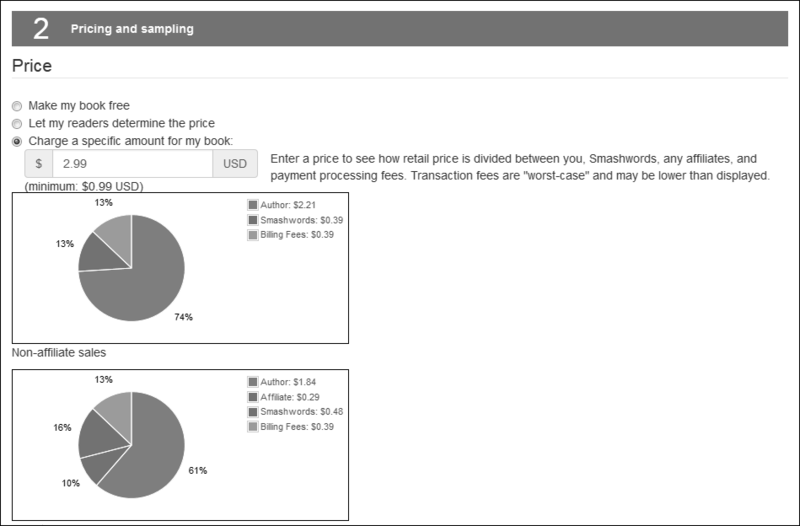 Three graphs will display indicating the different royalties that you will earn, based on the price of your book. The last part of this section is the sampling percentage you want to offer your prospective customers. This is the amount of your book they can read free, before buying it. The categorization section is where you choose the category(ies) for your book. When you click the first category option, further categories display. Choose from this list by clicking on the category name. And then at the end of the list, there are further choices. You then also have an optional Secondary Category. And that works the same as the Primary category. The last part of this section is to indicate whether your book contains adult content or not. Click the relevant radio button. Click in the field adjacent to the Add Tag button, start typing your keyword, and a list of suggested keywords will display (see below). If all your keywords are on the list, you can click the keyword in the list, and it will be added. Click the Browse button, select your image on your computer and upload it. Heed the advice from Smashwords: “Do not upload your book without a professional cover image.” Your book will be judged by its cover :o). When your file is uploaded, the file name of your image will display adjacent to the Browse button. Click the Browse button, select your book file (Word .doc) on your computer and upload it. When your file is uploaded, the file name of your book file will display adjacent to the Browse button. All that remains now is to click the checkbox, that you agree to the Terms of Service, and then click the Publish Immediately button (unless you’re making use of the pre-order option). The screen will display. Depending on the file size of your cover and book file, this may take a few minutes. When your book is successfully uploaded, the following screen will display. You can now view your uploaded book, and check to see that everything is as it should be. Your book is published to Smashwords! If you view your uploaded book, a screen similar to the following will display. 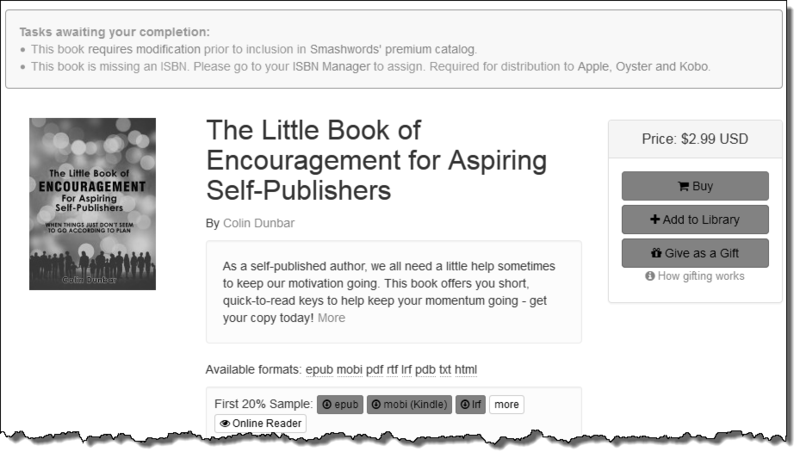 Even if you have your ISBN in your book, you will need to add your ISBN at the Smashwords ISBN Manager. 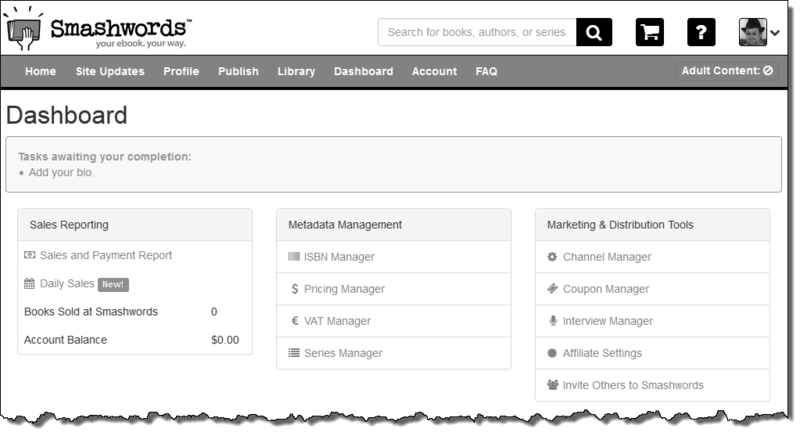 This is done easily – click the ISBN Manager link, and follow the steps on the site. 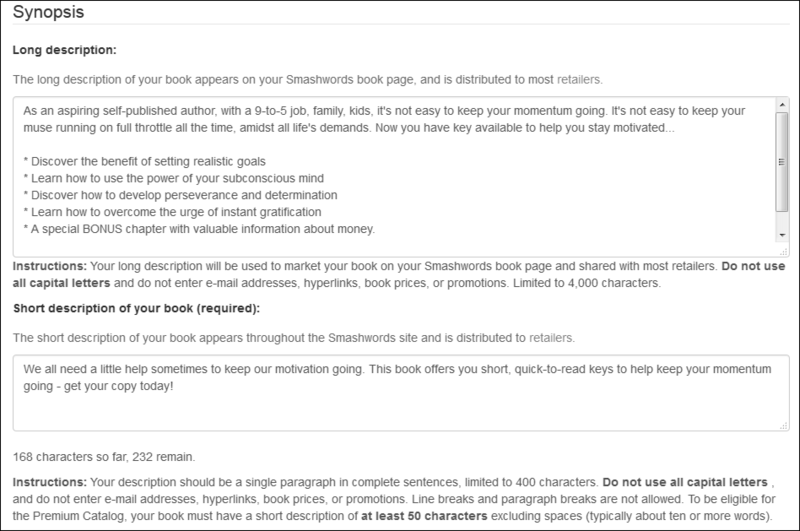 If you have followed the steps on formatting your Smashwords ebook closely, you should not have any errors. If there are errors, fix them in your Word file, and re-upload the file, using the Upload new version link (see below). You will receive an e-mail from Smashwords within minutes of uploading your book files. If you had errors, corrected them and re-uploaded your file, you will receive another confirmation mail, with the same subject line. We’re getting close to the end… you’re nearly done formatting and uploading all three versions of your book: Hard copy, Kindle, and Smashwords. See you next time for uploading to CreateSpace.